Soldier:"I am authorized to place you both under arrest, and transport you to a designated resettlement facility..."
Shrek:"Oh really? You and what army?" Donkey:"Oh and it is lovely! Just beautiful! You are quite a decorator... its amazing what you've done with such a modest budget! I like that boulder! That is a nice boulder!" Wooden Puppet:"I'm not a puppet! I'm a real boy!" Donkey:"Please don't turn me in! I'll never be stubborn again! I can change, please give me another chance!" Donkey:"Blue flower, red thorns... blue flower, red thorns... blue flower, red thorns... this would be so much easier if I wasn't color blind!" Shrek:"Why are you following me?!" Donkey:"Please! I don't want to go back there! You don't know what its like to be considered a freak!... well, maybe you do, but that's why we gotta stick together! You gotta let me stay please!" Lord Farquaad:"Run run run as fast as you can, you can't catch me, I'm the ginger bread man!" Lord Farquaad:"Tell me! Or I'll..."
Ginger Bread Man (Gingy):"No not the buttons! Not my gumdrop buttons!" Donkey:"Wow! Only a true friend would be that truly honest." Princess Fiona:"What kind of knight are you?!" Shrek:"Sure it's big enough... but look at the location." Donkey:"This is gonna be fun! We can stay up late, swapping manly stories, and in the morning... I'm making waffles!" Donkey:"Oh pick me! Oh I know! I know! Me! Me!" Princess Fiona:"You didn't slay the dragon?!" Shrek:"It's on my to-do list, now come on!" Donkey:"Hey wait a minute, I got a great idea! I'll stick with you!" Donkey:"Oh wow! That was really scary! And if you don't mind me saying, if that don't work your breathe certainly will get the job done because you definitely need some tic-tacs or something because your breathe stinks!" Shrek:"Oh no no no, dead broad off the table!" Dwarf:"Where else are we supposed to put her? The bed's taken." Donkey:"Look, you love this woman don't you?" Donkey:"Then you got to got to try a little tenderness! The chicks love that romantic crap!" Donkey:"Before this is over, I'm gonna need a whole lot of serious therapy." Shrek:"Thank you very much! I'm here till Thursday!" 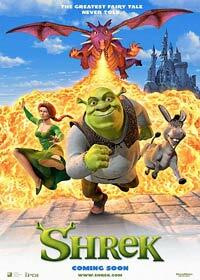 Donkey:"Don't die Shrek! And if you see a long tunnel, stay away from the light!" Donkey:"Wow!.... lets do that again!" Shrek:"No! No no no no!"